Not only will performing this test give you peace of mind that your emergency equipment is in full working order, but it will also ensure you remain compliant. If a shower fails to function correctly or further injures an employee you could face significant fines and/or imprisonment. What is the purpose of a weekly activation test? The weekly activation ensures that flushing fluid is readily available to the head(s) of the unit for the required time in the event of an emergency. This includes eyewash or eye/face wash heads as well as shower heads. It also clears the line of any sediment build-up that could prevent water from being delivered to the shower or eye/face wash and minimises contamination due to stagnant water in the pipework. "give you peace of mind that your emergency equipment is in full working order, but it will also ensure you remain compliant"
How long should the activation be? The length of time needed for this test depends on how much water is contained in the unit itself and within the pipes that do not form part of a continuous circulation system. The aim of the test is to completely flush out any stagnant water in this pipework. 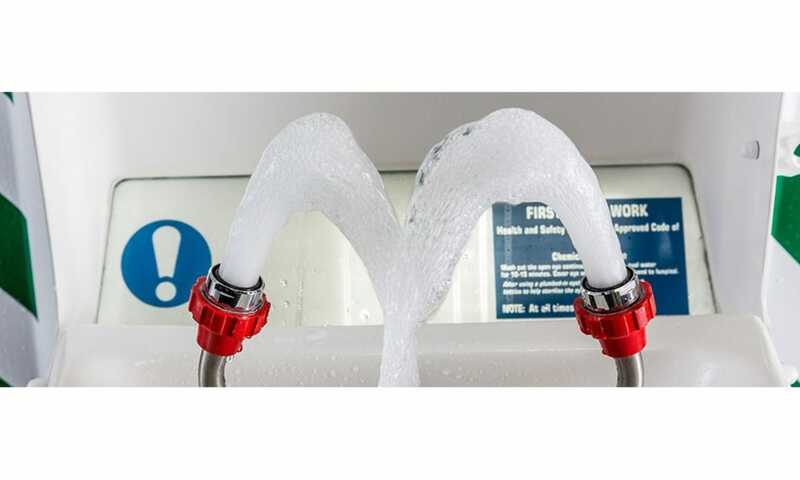 Whilst a quicker activation may seem sufficient, 5 minutes is recommended to ensure the pipework is fully flushed and any issues can be identified. In places where it is difficult to flush a large amount of water, the shower or eye/face wash should be activated for at least 1-2 minutes. This testing should replicate a real-life scenario so you can be confident your safety shower and eye/face wash will perform correctly in the event of an emergency. Download our weekly activation test record to keep track and take a look at our weekly inspection checklist for an easy to follow process. Established in 1968, Hughes have built a reputation for innovative engineering design, stringent quality standards and compliance with European and International standards. You’re in safe hands with Hughes Safety Showers.